We are Bob and Michelle. 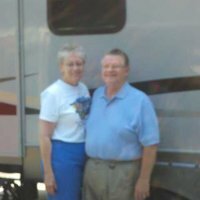 We are retired "almost full-time" RVers, interested in traveling and enjoying as much of the USA as possible. We are exploring and enjoying the world of workamping and volunteering. Bob's work experience was in research and development in the military and defense industry, while Michelle's career was in administration, human resources, and retailing. We are parents and grandparents. Bob has become a travel writer. He also enjoys fly-fishing, fly-tying, geocaching, internet research, and American history. Michelle is a very experienced quilter and also enjoys geocaching. Bob's career created skills in organizing and managing people and projects, well developed quantitative skills, experience in preparing and presenting on many subjects to a wide variety of audiences, teaching adult classes, experience using computer hardware and software especially Microsoft Office. Michelle's working career was in administration and then in retail. She is an experienced Quilter with about thirty years of experience and the tales to go with it. Our recent years have concentrated on travel. The summer of 2017, we traveled the 'Great River Road', following the Mississippi River its entire length from Venice, LA to Lake Itasca, MN. Bob has become a travel writer, maintaining a travel blog, and writing short fiction stories. No pets right now. We lost our beloved Golden Retriever to cancer a couple years ago. She was a great friend and a wonderful traveler. We miss her and are thinking about another dog. Right now, however, the call of the open road is too strong to introduce another 'youngster'. We love every square mile of this great land of ours. Boondocking gives us a chance to visit wonderful people who share our love of travel. We are both from the northeast. A few years ago we became full-time RVers. Then bought a house in an RV resort near Titusville, FL. We spend the winter there and the summer on the road workamping or just traveling. 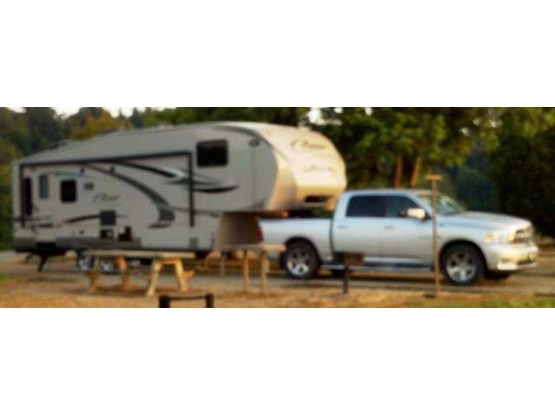 Our rig is a 2011 Cougar High Country Fifth Wheel pulled by a 2010 Dodge Ram 1500 truck. Length is 32 feet. Connected length is 48 feet.